Kouvola is a town and municipality in southeastern Finland. Sandcastle Lappeenranta and Langinkoski Imperial Fishing Lodge Museum will appeal to history buffs. Shop till you drop at Sibelius Hall and MyGoodKnife. You'll find plenty of places to visit near Kouvola: Hamina Old Town (in Hamina), Lappeenranta (Lappeenranta Fortress, Saimaa Canal, & more) and Kotka (Sapokka Water Garden, Linden Esplanade, & more). On the 16th (Fri), spend an exhilarating day on the slopes at Mielakka Ski Center. The adventure continues: take a stroll through Stromforsin ruukki, take in the dramatic scenery at Imatra Waterfall, learn more about the world around you at The Recreational Fishing Museum of Finland, and learn about winemaking at Pihamaa Estate & Winery. 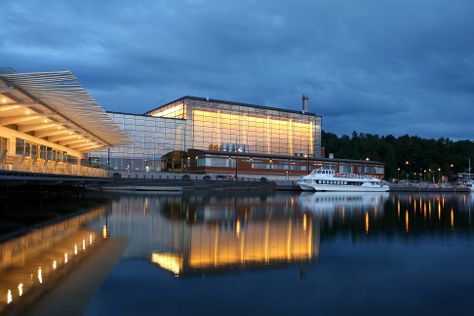 Ask Inspirock to suggest an itinerary and make planning a trip to Kouvola fast, fun, and easy. If you are flying in from Austria, the closest major airports are Helsinki Vantaa Airport, Tampere-Pirkkala Airport and Turku Airport. In August, daily temperatures in Kouvola can reach 24°C, while at night they dip to 13°C. Finish your sightseeing early on the 17th (Sat) so you can travel back home.